Automatic transmissions in motorcycles are not new, with Ridley being one manufacturer currently producing them. In fact, back in the 1970s, Honda and Moto Guzzi both produced motorcycles with automatic transmissions, each with two forward gears. Honda called its system “Hondamatic” and the bikes are still in demand today because of their shiftless nature. That older machine used an automatic transmission quite similar to the one that came with the Civic, complete with a torque converter. Honda has also used an automatic centrifugal clutch on many of its small-bore play-bikes from the 1950s on. So it’s not too big of a surprise that Honda is going to be introducing the DN-01 at the 40th annual Tokyo Motor Show, complete with an automatic of its own called the Human-Friendly Transmission (HFT). After the break, we’ll give a brief description of this new transmission. As you’ll see, it’s a very different animal from what has been offered before. Those who follow motorcycling news closely may remember that almost two years ago, Honda first showed the DN-01 concept at the 39th Tokyo Motor Show. 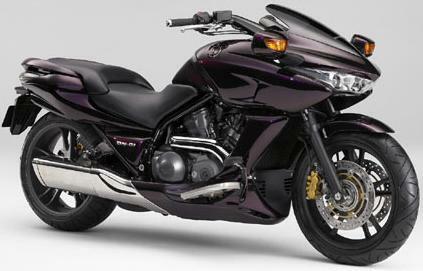 That bike featured a 680cc V-Twin engine and an earlier version of Honda’s still-in-development HFT transmission. Looks like they’ve finally gotten the development work done, because they are now saying that the DN-01 with its HFT is “a new motorcycle scheduled for market launch”. We think that’s pretty darn good timing, considering that Aprilia is just about ready to start offering its 850 Mana, which also features a V-Twin and an automatic transmission. Looking like the result of a Vulcan mind meld between a Honda Helix and the new CBR1000RR, the DN-01 concept from ’05 kept the floorboards and low seat height from the scooter and added the wheels, engine and exhaust from the motorcycle. We’re not sure if the production bike will keep this same look, but the low seat height should at least stay put. If you hate the looks of the DN-01, consider the Aprillia 850 Mana, which looks much more traditional. We’ve got to hand it to Honda here, because it has come up with something pretty creative for production in the HFT. The engine powers a hydraulic pump, which in turn powers a hydraulic motor. By varying the speed between the two, the transmission can either increase the output torque or the output speed, making for an infinitely variable transmission. Honda believes that the transmission will be the world’s first variable hydraulic transmission that features lockup, which should cut down the losses of the hydraulic system for greater efficiency and better fuel mileage. TOKYO, Japan, October 4, 2007â€“Honda Motor Co., Ltd. announced that it has developed the Human-Friendly Transmission (HFT), a new automatic transmission system for motorcycles using Honda’s own infinitely variable hydraulic mechanical transmission. Easy to operate, the HFT realizes outstanding relaxed riding comfort, riding feel with direct response and excellent transmission efficiency. The HFT will be installed on the DN-01, a new motorcycle scheduled for market launch to be introduced at the 40th Tokyo Motor Show. With Honda’s own infinitely variable hydraulic mechanical transmission, this HFT realizes the lightweight and compact configuration required for motorcycles. To meet the wide range of rider needs, HFT offers a selection from two fully automatic shifting modes-D mode for ordinary riding and S mode for a sporty riding experience-or the 6-speed manual mode, which gives riders the option of riding with a manual transmission feel. The HFT creates a unique riding feel through easy operation, ranging from relaxed and laid-back riding to nimble and sporty with direct throttle response. With the aim of providing products useful in the every day lives of customers, Honda has developed and sold motorcycles equipped with easy-to-operate automatic riding technologies. As a pioneer in the era of automatic systems, Honda launched the Super Cub C100 in 1958, equipped with an automatic centrifugal clutch mechanism, which allowed riding without the need of clutch operation. The Eara (750cc), released in 1977, was a first large-sized motorcycle featured a torque converter in Japan. In 1980, Honda put the Tact on the market, a machine equipped with the Honda original continuously variable transmission, the V-Matic, and Honda has continued to develop a variety of new mechanisms up into the present. The HFT also features the world’s first lockup mechanism for an infinitely variable hydraulic mechanical transmission. When cruising, this lockup mechanism works to minimize transmission efficiency losses, contributing to improved fuel economy.